от 15 шт. — 145 руб. 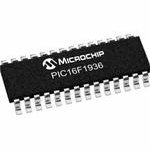 The PIC16F range of microcontrollers from Microchip are 8-bit MCUs that incorporate Microchip&apos;s PIC® architecture into a variety of pin and package options, from space efficient 14-pin devices to feature-rich 64-pin devices. Devices with Baseline, Mid-Range or Enhanced Mid-Range architecture are available with numerous different peripheral combinations, giving designers flexibility and choice for their applications. 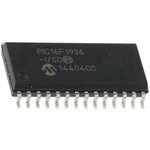 The PIC16F1934/1936/1937 family of microcontrollers is based upon Microchip&apos;s enhanced mid-range core with a 16 level deep hardware stack and 49 instructions. These MCUs provide up to 8 MIPS, up to 14 Kbytes program memory, up to 512 bytes RAM and Data EEPROM of 256 bytes. On board is a configurable oscillator with ±1% accuracy.